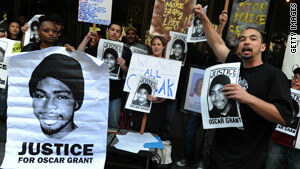 Oakland residents demand justice at a March rally honoring Oscar Grant. (CNN) -- A former police officer who is white was found guilty of involuntary manslaughter Thursday in the killing of an unarmed black man in Oakland, California. The verdict was announced in Los Angeles, where the trial was held, shortly after 4 p.m. PT (7 p.m. ET). Johannes Mehserle, who was a Bay Area Rapid Transit police officer at the time of the incident, was accused of shooting 22-year-old Oscar Grant on an Oakland train platform on January 1, 2009. Mehserle could have been found not guilty, guilty of second-degree murder or guilty of voluntary manslaughter -- or guilty of involuntary manslaughter, as the jury decided. The trial was moved from Alameda County to Los Angeles due to pre-trial publicity. Mehserle, wearing a gray suit, blue shirt and red tie, showed no emotion during the reading of the verdict. The former officer did not saying anything to Superior Court Judge Robert Perry or attorneys. About a dozen Los Angeles County deputies escorted the handcuffed defendant out of the courtroom after the verdict was announced. Outside the courtroom after the verdict, Grant family members expressed outrage at the verdict. "My son was murdered. He was murdered. He was murdered. My son was murdered," said Grant's mother, Wanda Johnson. "The system has let us down but God will never ever let us down," she said. Johnson and other speakers said African-Americans have too long been the victims of police abuse and a biased judicial system. She said Mehserle wasn't found accountable. "We couldn't get even six hours of deliberations," said Johnson, who claimed jurors weren't fair. Oakland police were deployed in riot gear later Thursday as sporadic street demonstrations were launched by people unhappy with the verdict. Mehserle, who was on duty when the shooting occurred, said at the trial that he intended to draw and fire his Taser rather than his gun, CNN affiliate KTVU reported. Wanda Johnson rocked back and forth in her seat and closed her eyes during the reading of the verdict. Sentencing is set for August 6. Involuntary manslaughter normally carries a maximum sentence of up to four years in prison under California law. But the judge could add an "enhancement" that could provide a longer sentence because a firearm was used in commission of a crime. Bay Area Rapid Transit police were called to Oakland's Fruitvale station on January 1, 2009, after passengers complained about fights on a train. Officers pulled several men, including Grant, off the train when it arrived at Fruitvale. The video showed Mehserle pulling his gun and fatally shooting Grant in the back as another officer kneeled on the unarmed man. After the verdict, California Gov. Arnold Schwarzenegger appealed for restrained reaction. "I encourage Californians to remain calm in light of the verdict and not to resort to violence. I have spoken to Oakland Mayor Ron Dellums and have assured him we are well prepared to assist in maintaining order." "The journey to justice does not have to end here," he said. CNN's Stan Wilson contributed to the report.